A roundtable event at the House of Commons has called for greater public and professional awareness of the condition prosopagnosia, also known as face blindness. The event was hosted by Dr Sarah Bate from BU’s Centre for Face Processing Disorders at Bournemouth University and Tobias Ellwood, Bournemouth East MP and Parliamentary Private Secretary to the Secretary of State for Health. Prosopagnosia is a cognitive condition which means people find it difficult to recognise familiar people from their faces – sometimes leaving them unable to identify even their closest relatives or their own reflection in the mirror. Although it is thought to affect around 1 in 50 people it is not a formally recognised condition, and so people often find it difficult to access support and guidance. The breakfast roundtable event called for measures to promote greater public and professional awareness of prosopagnosia – especially in schools, workplaces and the healthcare system. 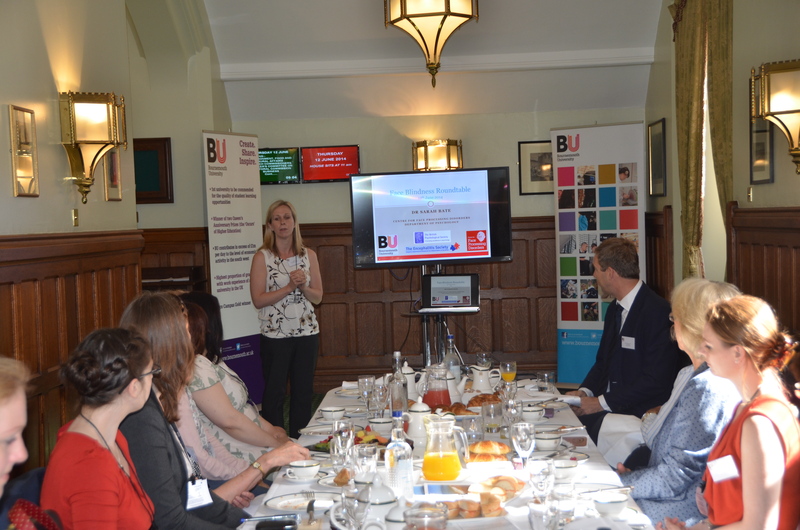 Dr Sarah Bate, a Senior Lecturer in Psychology at BU, said: “The roundtable was a fantastic opportunity for us to present our awareness campaign to key influencers, and we are very grateful to Tobias Ellwood for hosting the event. The event was supported by a Public Engagement Grant that was awarded to Dr Bate by the British Psychological Society (BPS), and further assistance was provided by the Encephalitis Society. Representatives from both organisations attended the roundtable, and continue to support the awareness campaign. Members of the London Faceblind Group also spoke at the event, talking about their experiences with the condition and the need for greater awareness and support. Jo Livingston from the group spoke about the impact that the condition can have on children at school – including problems socialising or being incorrectly diagnosed with behavioural disorders. The awareness campaign has a number of aims, including formal definition and classification of prosopagnosia; the development of a national face blind organisation; and promoting awareness and key guidance in a top-down manner in schools, workplaces and the healthcare system. Tobias Ellwood MP, who later blogged about the event, said he was keen to support the campaign. The roundtable event featured the premiere of a face blindness awareness video, created by the BU Centre for Face Processing Disorders, the British Psychological Society (BPS) and the Encephalitis Society and funded by the BPS’s Public Engagement Grants scheme.